To view this video, visit https://youtu.be/nHgjEUC7c2Q. Most sentences show their subjects and verbs. Command sentences have a hidden subject: You. 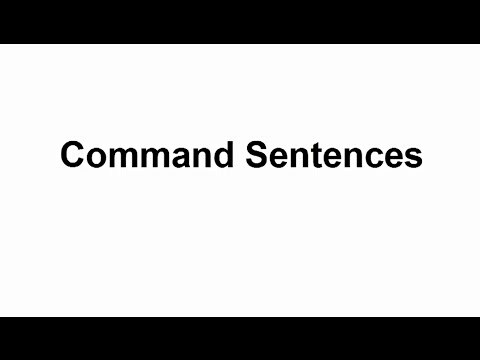 Watch this video to learn how to make command sentences. You will help us clean the house on Saturday. You could empty the dishwasher. Mom will assign different jobs to different people. I could sweep the floors. Someone should change the hamster cage. Everyone will help out in the house. We all will wash the car as well. We should wax it so that it shines. We will start at 10:00 a.m.
You should get up by 9:00 a.m. Creating Command Sentences by Thoughtful Learning is licensed under a Creative Commons Attribution-NonCommercial-ShareAlike 4.0 International License. Based on a work at k12.thoughtfullearning.com/minilesson/creating-command-sentences.